Went out along with my son for a night under the stars. After the long drive, at 5 minutes past 11, the planned spot at a State park did not work out – they just closed the gates prior to our arrival. This led to a drive around the unknown rural roads. 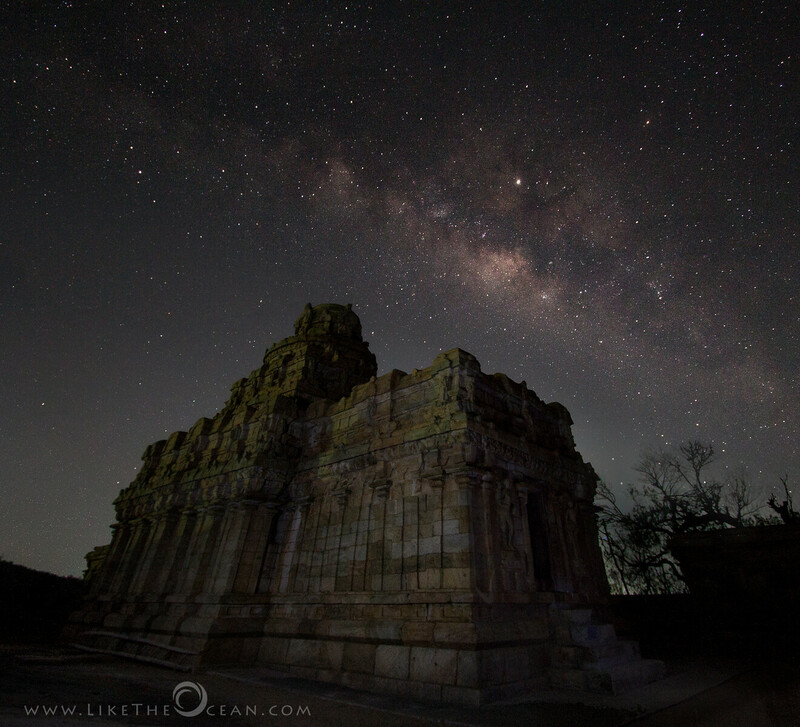 After some scintillating conversations, light painting and trying out some Milky way shots, came across this lovely spot. It was quiet a place to take a walk. Unlike city, there were no harsh lights to showcase the stone road, just the light of the stars and the sounds of the night. On the left were close to a hundred cows, casually mowing the grass. Only after we crossed the field, were we able to see the light, at the front yard of this house. Just enough for them and not polluting the night sky. It was quiet a scene, literally ! Buckingham Fountain at Chicago, is seriously beautiful. A favorite spot in the city, one can literally spend hours hours watching the fountain. 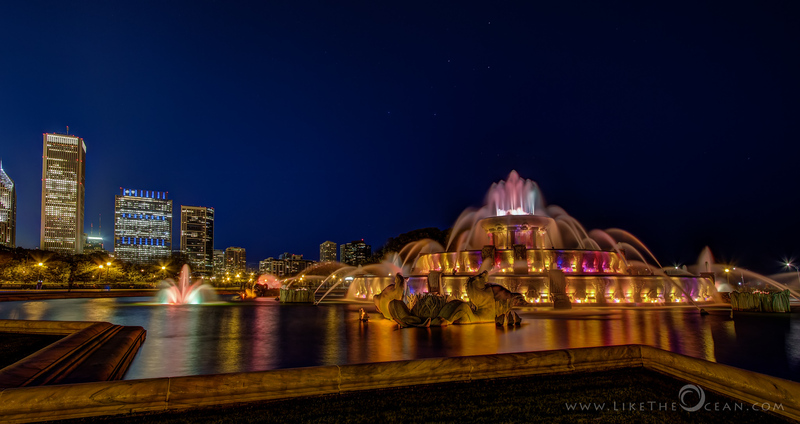 The backdrop of Chicago or the lake, behind the fountain make it even more gorgeous. With 134 jets and a fountain water capacity of 1.5 million gallons, it roughly pumps 14,100 gallons of water per minute. Water is re-circulated from the base pool after the basins are filled and not drawn from the outside except to replace losses from wind and evaporation. Some amazing engineering – be it the stupendous architecture or the the lighting at the dusk or the synchronous music that goes along with the lighting. The fountain located in the shores of Lake Michigan also symbolizes the lake itself, with four pairs of sea horses representing the four states that border its shoreline. I present to you Sea horse, Skyline and some stars at Buckingham Fountain, Chicago. Definitely well worth checking out in large. How do u like it ? EDIT : There is an update to the Scripts with much more features and a UI now. 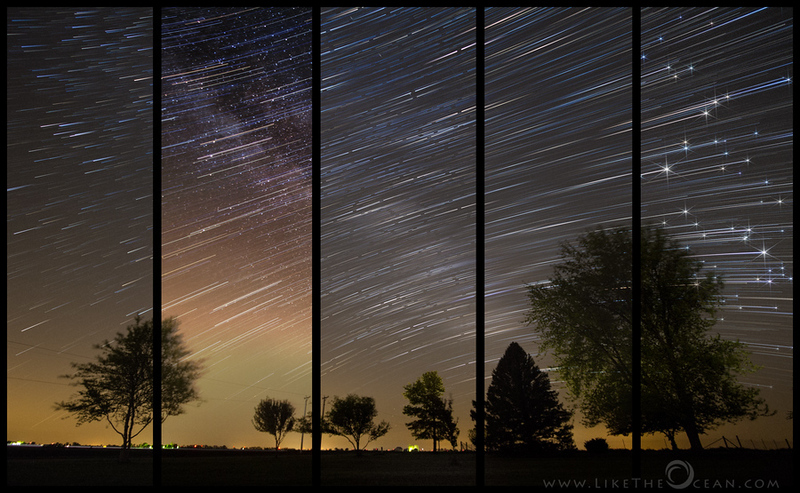 Check out this article – Scripts to Make your Star Trails Awesome – for more details. I am still leaving this old article in place (along with the script) as it provides some insight into how the codes is designed / works. Thanks !!! This is the second installment of the Star Photography Article. If you are just getting started do check out – Sleeping with the Stars. The below article predominantly focuses on Post Processing i.e. once you capture your shots. If you ended up here thru Google looking to set up for Star Trail shoots check out this comprehensive article @ Star Circle. 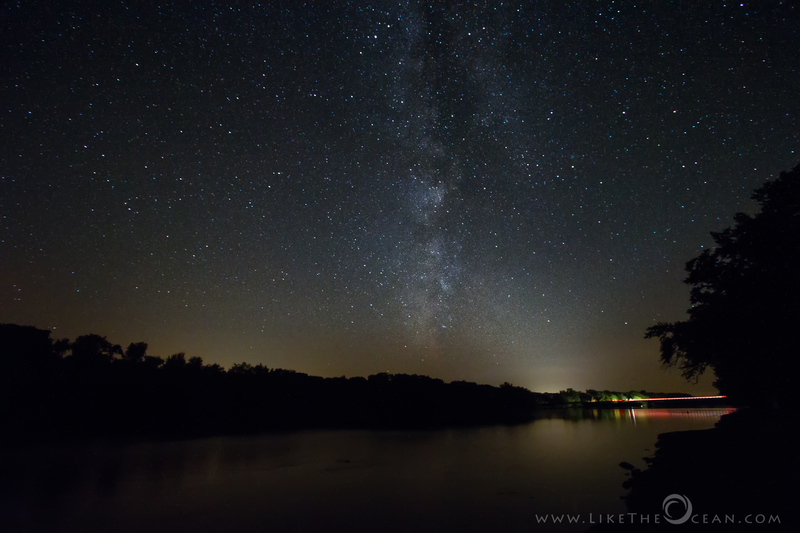 If you had read my earlier article – ‘Sleeping with the Stars’ you would have noticed that I mostly shoot milky way shots. 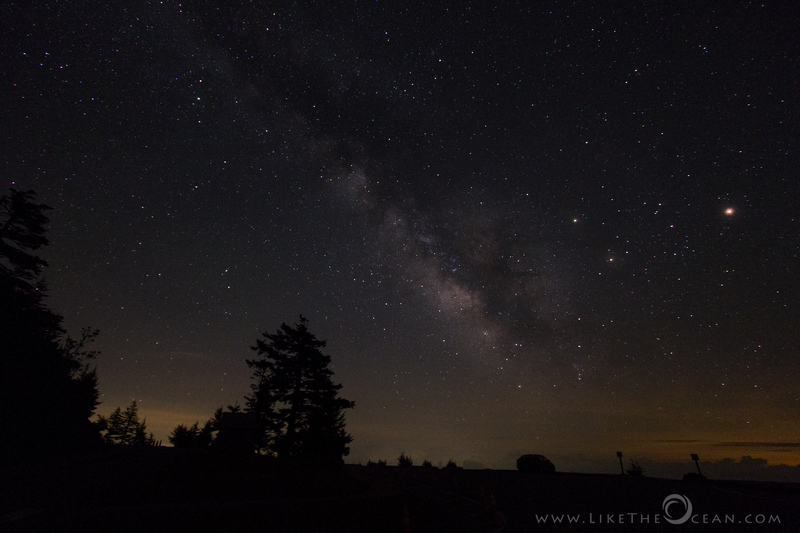 For some reason I preferred capturing the Milky Way at its full clarity like this, rather than the star trail style. It all changed until I came across some amazing Comet style processing of star trails like this. The more I was looking at these, the more I was intrigued. 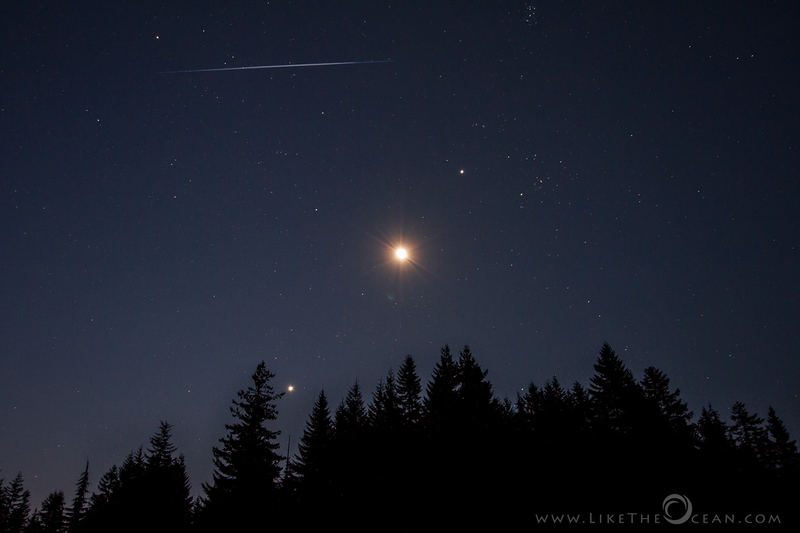 As to getting the normal star trail effect – there are two ways of achieving it. One is a really long exposure – getting everything in a single shot, exposed probably for even hours together. The other is get shorter exposure of around 30 seconds or less and have them merged later in post processing. I prefer the latter, as it gets really interesting with the post processing options. For a regular star trail you could just fire up StarTrail.de to get the final trail effect like this. But with shots like this, it involves – a combination of steps from shooting multiple exposures, and manually editing each layer to achieve desired effect. As I was searching online there was lot of information on how to set up and shoot for star trails. There was information on processing too, but there was no step by step approach on getting custom effects. As I was working on this, came across David Kingham’s article, which was quiet comprehensive. It was not too over whelming, just simple steps on how to go about achieving this effect. This article also talks about Photoshop Droplets. Though simple, I was never able to get my head around Photoshop droplets. For me – personally – the concepts of droplets was little contrived. Even if you find it simple and manage to load multiple shots as layers, Photoshop does not give an easy way of setting up the Mode for multiple Layers. Additionally setting opacity across larger number of layers is even more cumbersome. The simple but tedious solution is go thru each layer and set the opacity manually. Manual & mundane tasks always come in the way of creativity and does not let you focus on the end results. I was exploring ways to refine the process with more flexibility and reduced manual effort. That is when I learnt about Photoshop Scripting, inspiring for this Photoshop Script and eventually this article. Surprisingly it is not complex at all. Edit the Script to set the basic style. For tweaking the script beyond the below control variables refer to this session on Code break up and overview. BLEND_MODE : As the name suggests this variable controls the Blend Mode between the multiple layers. The default value is LIGHTEN. Based on my trials, I suggest to use LIGHTEN (1) for best results. For some types of images SCREEN might also come in handy. When trying out the script multiple times for different effects, you can also use a value of ‘0’ to leave the Blend mode between layers untouched. This is handy and saves time especially when you have large number of layers. CREATIVE_STYLE : This variable drives the pre-defined style. 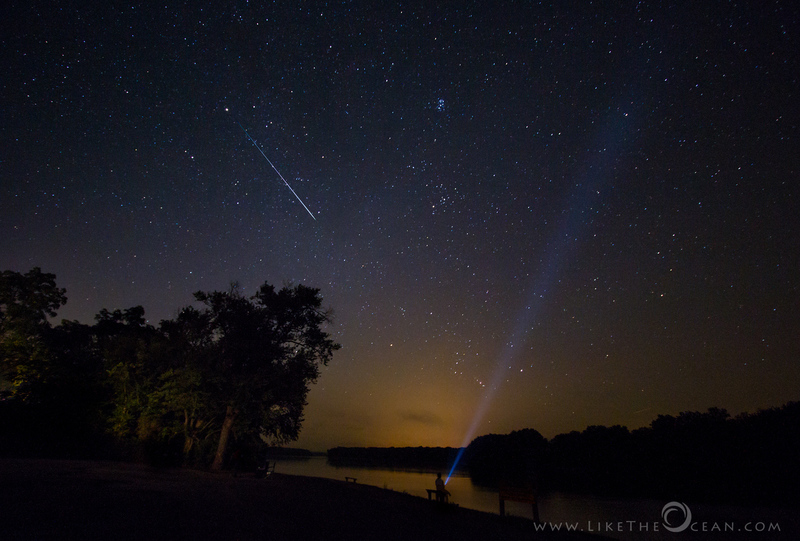 Comet Style [1,2] : This is the preferred effect of comet streak – from light to dark. With an option of 1 or 2 the effect can be from either of the directions. Try both and decide which suits better for your composition. Saucer Style  : I kind of liked this. It gives a strange metallic, yet smooth feel to the shot. The effect is similar to that of a flying saucer. Depending on the power of your system give it a minute or two for the script to complete its action. Repeat steps 3 and 4 until you are satisfied with the results. If you are using a large number of RAW files as layers, the overall file size might be too huge to save (depending on the File System you are on, for eg. FAT32 does not allow to save files any greater than 2GB). Once you have the expected results from the script, you can merge all layers to reduce file size before saving the file. Do remember to save the file as *.PSD at this point. Local Contrast and Colors : Leverage on Photoshop Levels / Curves to get the local contrast up. This can also be achieved with the Clarity and Vibrance options in Lightroom. Controlling the Temperature of the shot helps to add a cool feel. 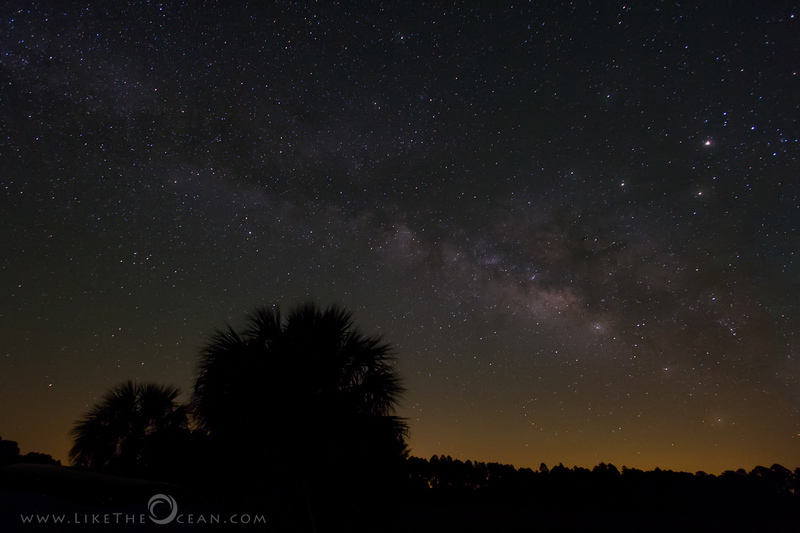 Merging Multiple Files : Process one of the shots to enhance the milkyway. Have this overlayed with the current set of shots. This results in some pretty interesting effects like this one. Star Spikes Pro : This is a plugin for Adobe Photoshop and other compatible editors. Provides a rich set of adjustments to create perfect optical spikes especially for the star shots. Aids in taking the creative options to a different level !!! Feel free to customize more if you are brave :) If you are new to Photoshop scripting (like me) – this article should get you started. The intent of this section is to provide a quick overview of the script flow and some key variables. This should help is tweaking the script further or building on top of it. There are two major portions with this script – one setting the Blend Mode of the layer and the next one is setting the opacity of the layers. trailLength –> calculate the length of the trail based on the number of exposures. The trailLength is also validated to being odd so the effects can be uniformly applied across layers. A frame is dropped if needed to achieve this. This variable also drives the mirror effect in Saucer Style and SpaceShip Style. myOpacity –> The opacity value is dynamic controlled with the for loop and adjusted as per the creative style selected. The logic here can be tweaked to get varied effects. Beta Tag: This is still in Beta. I am not responsible if this script fries your motherboard or you get the notorious BSOD. Just kidding, this is just a harmless script, the worst it can do it pop up errors for any Out of Bound values. But still I’m not responsible ;-) You can get back to this page anytime to see if there is an updated version (hint hint – do bookmark ;-) ). Alternatively leave me a message either via the contact form or the comments, if you would like to be notified when there is an update to the script. If you have any suggestions or identified any bugs, feel free to drop me a note or use the comment session. Would appreciate a link back if you find this script helpful. All the more would love to see the work you create using the script. Do leave a link to any work you create, in the comments below. Calvin : Well, when u look into the infinity of the night, you realize there are far more important things than what people do all day. When you see amazing shots of Milky Way like these, it is probably not by coincidence that the photographer ended at the right place (away from the city lights) and at the right day (new moon or moon still below horizon) and the right time (where the milky way aligns with the foreground for a catchy composition) with the right weather. More often than not, these are results of meticulous planning. I share with the you the key steps that go into the planning and setting up of the shots. It might look elaborate, but believe me, once you get in the grove – it will be become second nature to you. I was initially surprised to find out that the prominent and dramatic portion of milky way is not visible the entire year. Here in the northern hemisphere – the best nights to shoot milky way are around spring, summer and fall. If you are in the southern hemisphere then fall, winter and a bit of spring would be ideal times. You could use a Planisphere to identify the stars visible from your location. Or with the aid of technology it is much easier – just use software like Stellarium (both mobile app and native desktop version) or Google sky map (mobile app). Stellarium – especially the desktop version is very handy for pre-planning. One can easily see the stars / galaxies that would be prominent for any given coordinates and time. Look SE in the spring a couple hours before sunrise, look South in the summer around midnight, and look SW during the fall an hour after sunset. You can even download landscape for prominent locations or create custom skyline for your particular location. In addition you can also look for specific galaxies, planets, or even check if International Space Station (ISS) would be crossing the frame when you are shooting. The Phase of the moon would greatly play into the planning too. 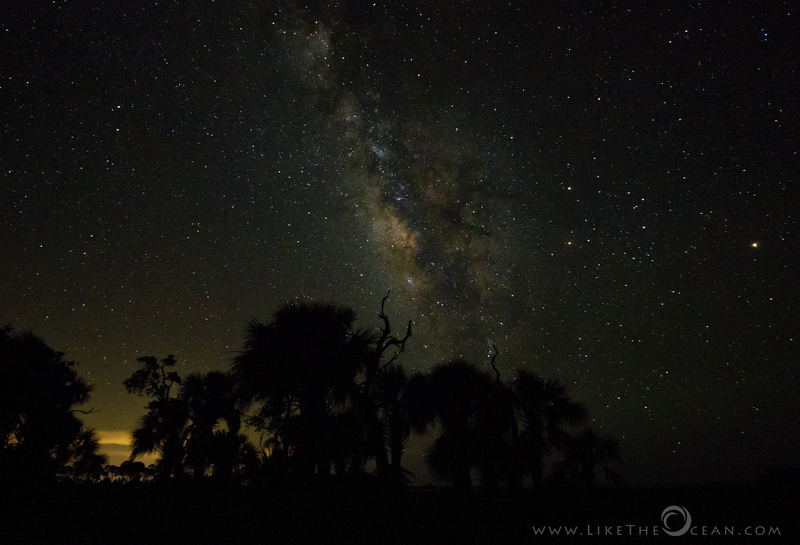 The full moon would definitely make it impossible to shoot the milky way, while a crescent moon can help light the foreground depending on its position. And do utilize Stellarium to check out the rise / set times of moon and the milky way along with their relative positions. Account for the local weather as you work to finalize the location and tentative dates. As you get close to the shooting date, check out the Interactive Map from Clear Dark Sky site – this is one of the best comprehensive site providing details on the cloud cover, transparency along with Wind, Temperature etc..
All you need is a clear weather and a dark sky. 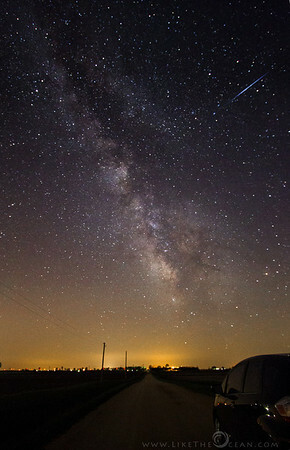 But given today’s light pollution, it might not be as easy to get access to dark skies. This site Dark Sky Finder – gives a quick look into the potential dark skies near your area (this is only for US, do leave a comment if you are aware of similar service for world over locations). Areas marked dark blue or black would be awesome, but you need a location that is at least green. I find Google Street view to be very handy, once you finalize the location. Is provides lot of insight into how the side roads are & if you have your set up under a particular tree over the night etc.. There are lots of articles – both comprehensive and captivating – on this subject, thanks to Google. So rather than going over the same again, have provided links to some of the best articles out there. Tripod : Manfrotto 190XPROB 3 As you already know, a tripod is a must. One that can go really low helps with some creative compositions. Red LED Light (Keychain) It takes as much as 15 – 20 mins for your eyes to get accustomed to the dark. This LED light would help changes / confirm setting on the camera in the dark. Any handy red or blue LED light would suffice. Nothing fancy. Do not use your regular torch or the mobile flash at it disrupts your night vision. But worry not, I have found Magic Lantern to be a very good alternative. This article is a prelude. Look out on this space for a follow up article on Creative Processing of the Star shots !!! Happy Shooting. Do share links to your shots and experiences below in the comments. The starry skies on a clear night is so peaceful and soothing. 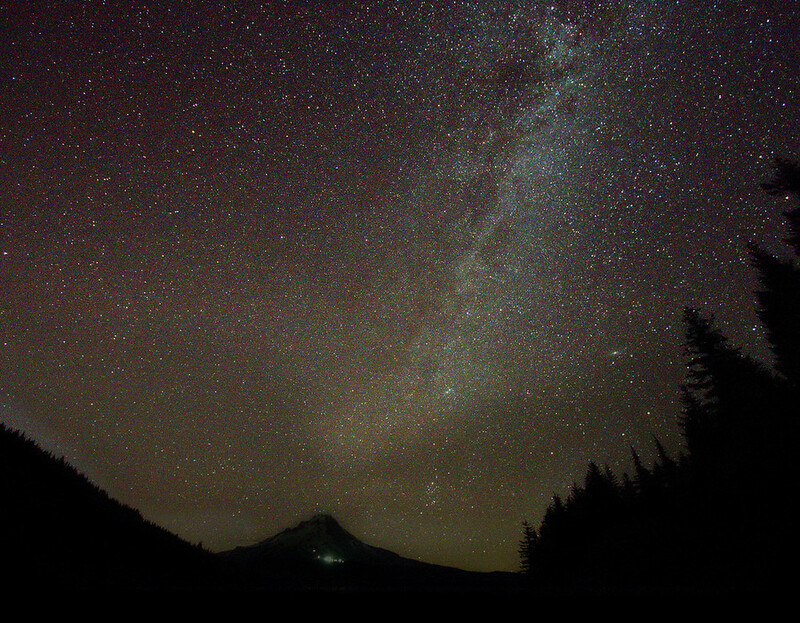 Trillium Lake @ the base of Mt hood is an awesome place for watching the stars too. 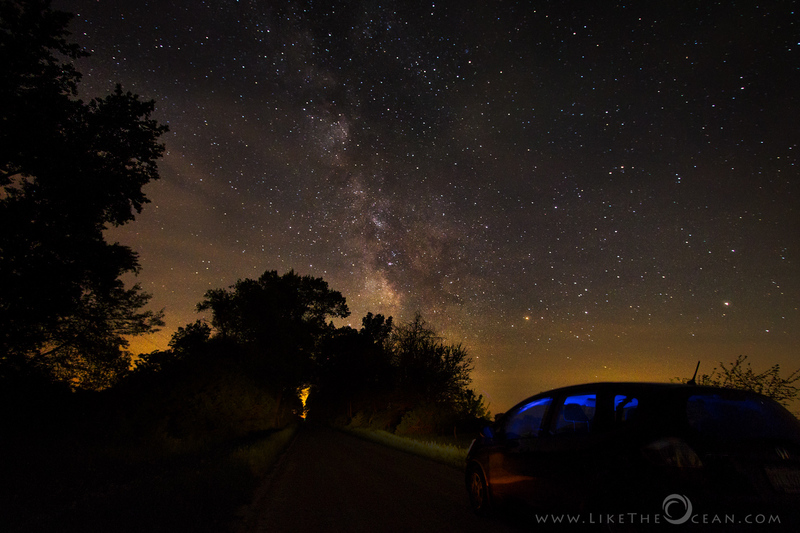 It is just far enough from the city to avoid the light pollution and short enough for an evening drive. At times, in the middle of nowhere, you find yourself. For two weeks, each year, during the endless nights, the secluded forests of Elkmont is converted into a magical wonderland. Photinus carolinus – or more commonly known as Synchronous fireflies – puts an amazing show each year around May – Jun, at the lovely mountains of Smokies. Unlike other fireflies, this species uses the synchronicity of the flashing, probably to attract it’s mate. No one is sure why the fireflies flash synchronously. Competition between males might be one reason: they all want to be the first to flash. Or perhaps they flash together, so they have a better chance of being noticed. Synchronous species of fireflies are very special—and they exist only in a handful of places throughout the world. Elkmont @ Smokies is one such place. These fireflies flash their little green-yellow bioluminescent lanterns in unison for about 6-8 blinks and then they go dark for a few seconds creating a sublime wave of light throughout the forest. If you are interested with how this was shot & processed, continue reading … else here are few more shots for you to enjoy. To watch the fireflies, it was quiet magical. To get them in a frame, it was quiet elusive ! The key to getting this shot was being at the right place, at the right time and a bit of luck. Once, these fell in place, it was time to wait. Not long after, the horizon begin to darken and the first of the fireflies being to twinkle. Here a twinkle, there a twinkle and before you know it – everywhere a twinkle. The entire night lit up in it’s mythical glow. In the recent years there had been a significant decrease in fireflies. This could be attributed to various climate changes, human footprint, light pollution etc. On top, the species of synchronous fireflies are even more rare in occurrence. There are only very few places that hosts these lovely angels – Smoky Mountains, Congaree National forest, Allegheny National Forest, South Asian Mangrove Forest and Oak Ridge Wildlife Management Area. Although it takes the lightning bugs one to two years to mature from larvae into adults, the lifespan of an adult is extremely short. Adult fireflies only live two to three weeks and don’t eat any more meals once they are an adult. The synchronous flashing happens as part of it mating ritual, for about week to two annually. In the US this is around May to June and depends on temperature, humidity, moon light etc. 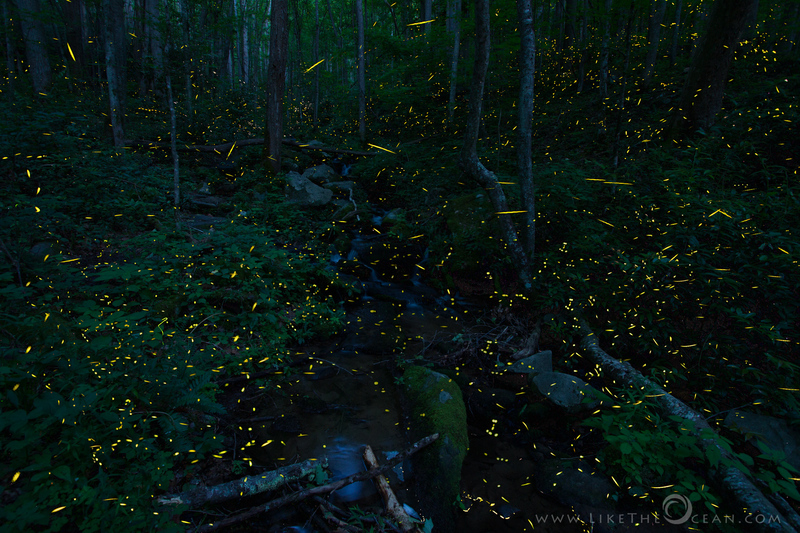 One of the most popular places to view the Synchronous Fireflies in the Great Smoky Mountains National Park is around Elkmont. The reason for popularity could be because, the National Park scientists use air and soil temperatures to predict the timing of each year’s mating season and publish the same via NPS website. This event has become so prominent, that a lottery system was instituted from 2016 to gain entry. During this time, access to Elkmont is closed at night time, with the exception of approved lottery users. Last year, I was not lucky enough with the lottery. But that helped to identify a new option to gain entry. This is my preferred option too. Though I did get the lottery this year, I still went with the latter. Not may folks are aware – but if you manage to secure a camp site reservation, you would have access to the campground and the trails. A huge advantage to this option – you would have access to all trails and not just be restricted to the public viewing area (initial 3/4 Mile of the Little River trail & Johns Creek). This greatly helps get to secluded spots, that are not hindered with flash lights and mobiles from passersby. But a word of caution, Elkmont campground is quiet popular and fills up months ahead. It takes some persistence and luck to grab a spot when a cancellation comes up. Ideal conditions would be an overcast sky or around a no moon night, so the moon light is not competing with these little fellows. This year though it was neither cloudy nor anyway close to a no moon day. This resulted in subdued and delayed firefly activity. This also made scouting for the location more critical. It was much easier to walk around when there was still twilight , to hunt for canopy of trees that would block the moon light. Once I got a decent spot and a composition I liked, it was a matter of setting up the camera and wait ! 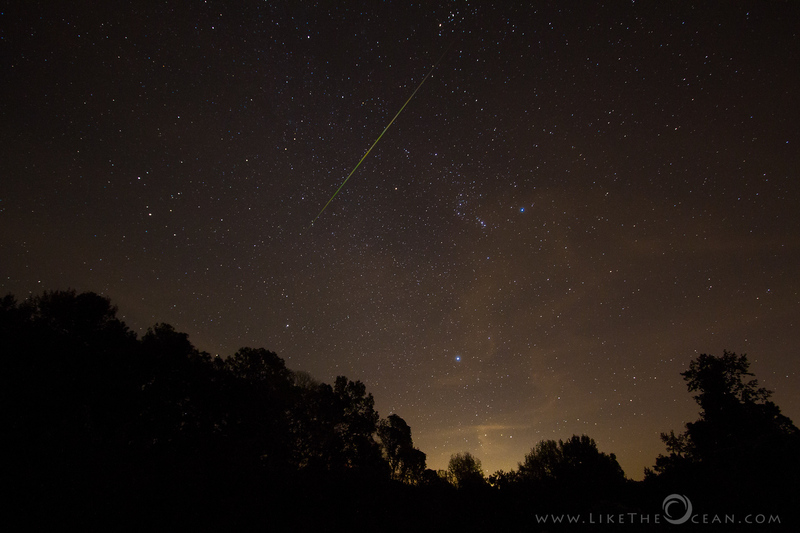 Shooting fireflies is very similar to shooting the stars. I personally prefer shooting multiple small exposure as opposed to one long exposure. This gives lot of creative freedom with Post Processing. Focus : If you have one the recent Sony cameras (A7SII, A7RII, A9) with crazy ISO, that can literally see and focus in the dark, you are good. Else it is better to focus as needed when there is ambient light and change to Manual Mode. Setting to infinity might not really help as the foreground is generally much closer. It even helps to lock the lens with a Gaffers tape, once the focus is set. This would ensure the focus is where we want thru the last shot ! Tripod & Remote Trigger: Since it would be a sequence of shots over a period of time, having a tripod is crucial. A sturdy tripod in conjunction with remote trigger would be ideal. A remote trigger with continuous shooting or intervalometer option would enable shooting continuously with out physically initiating each click. Base Shot : Depending on the ambient light , get several of exposures of the environment. This ideally would be in low ISO. The best of your base shot could be got from just before it goes dark. Shooting with a cool white balance would go with this. At this time, feel free to increase the exposure time with lowest ISO for minimal noise. FireFlies Shot : For this you want to get as much as possible. So shooting with a larger aperture is preferred. Anything less than f2.8 would also reduce the depth of field. Hence getting the getting the required focus in the beginning is critical. The aperture also would greatly define the feel of the shot. A wide aperture like 1.8 would throw the near by fireflies out of focus, given a smooth bokeh feel. The shutter speed would depend on the brightness of the flash and the effect you are targeting for. You can try out different options and see what works for the night. In this case IS 3200, F3.5 and 30 sec exposure worked pretty well (If the moon had not been there and the activity was higher, I would have reduced shutter speed down to 15 seconds). Shooting from 8:45 thru 11:40 PM, ended with 245 frames. At a high level the processing is simple – Have the base layer with Blend Mode of “Normal” and all the fireflies layer with the Blend Mode of “Lighten”. Since I had around 245 frames setting the blend mode one layer at a time would have been tedious. My Star Trail Scripts comes in handy for this by setting the blend mode in a single click (refer this article for details). In case there are any unwanted light streaks from passers by, it would show up in the final shot. The advantage of using smaller multiple exposure is that you could delete that particular layer or just mask the distracting portion of the layer. Skim thru each layer masking out unwanted portions, if any. Once you are happy with the final effect, duplicate the base layer and merge all but the new duplicated base layer. You would end up with a layer with Background and one more layer with Background including the fireflies. Changing the Blend Mode to “Duplicate”, would help create a layer with just fireflies. Kindles the tiny angels of the endless night. Witnessing the symphony of light. 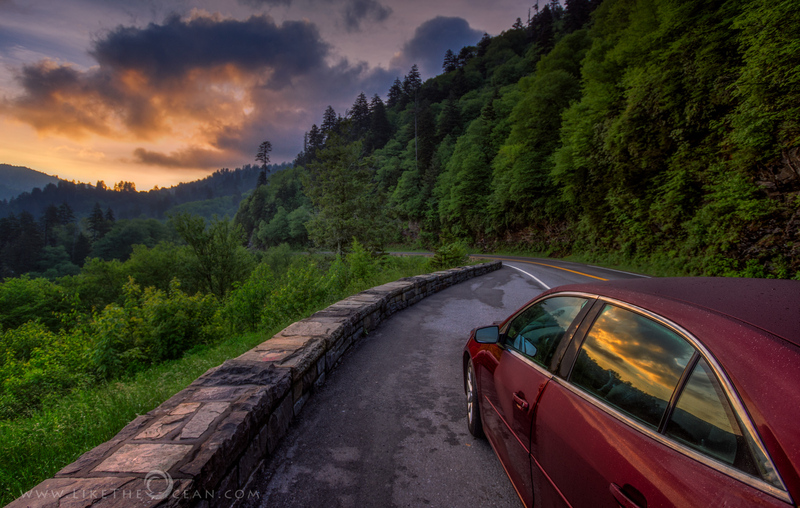 This past weekend, got a chance to drive by Smokies. As with last minute plans, needed a few creative ideas to make it happen. One of them was to just drive around and sleep in the car as needed. One of the huge advantage of car camping, is that you are always just a door away from a night full of stars or floating in a mystic fog or waking up to lovely view like this. After trying out some fun light experiments at the Clingmans dome, we decided to head out to NewFound Gap to catch some sleep. The intent was to be able to crash till twilight and be able to enjoy the sunrise from near a view point. But as it is aptly called – Smokies – the view was pretty covered with fog and overcast. It is good to get lost. It helps to find yourself. With technology today, one can afford to get lost, without getting lost. It is much easier to take that road not taken, knowing that you have access to GPS and can get back home, if u decide to. I generally plan for location and timing to get the golden light. But once in a while I do enjoy getting around without a destination. Not knowing where the path leads, making the journey even more interesting. This article is about how this Time Slice shot of a Lunar Eclipse was made. Its focus is mainly on the planning that went into it, even before the first shutter click. Let us start off by getting some key details of the event. There are several web sites that provide details on the astro events (like Space, SpaceDex, TimeAndDate, EclipseWise to name a few) and social channels. Though the complete Eclipse wasn’t visible, it turned out to be an advantage. As the moon was setting, it appeared to be dissolving into the the horizon. It is the vision, that drives the planning, that drives the execution. Create a vision in the mind’s eye as how u want to capture the event. This might not sound crucial, but does drastically increases the success rate of the final shot. It all starts with the vision. It is the vision, that drives the planning, that drives the execution. I have seen this to be true, not just for photography, but in other walks of life too :) There are a multitude of ways to capture the lunar eclipse. It can be just focused around getting the different phases of the eclipse or it can be getting a lovely composition of the landscape along with the blood red moon. 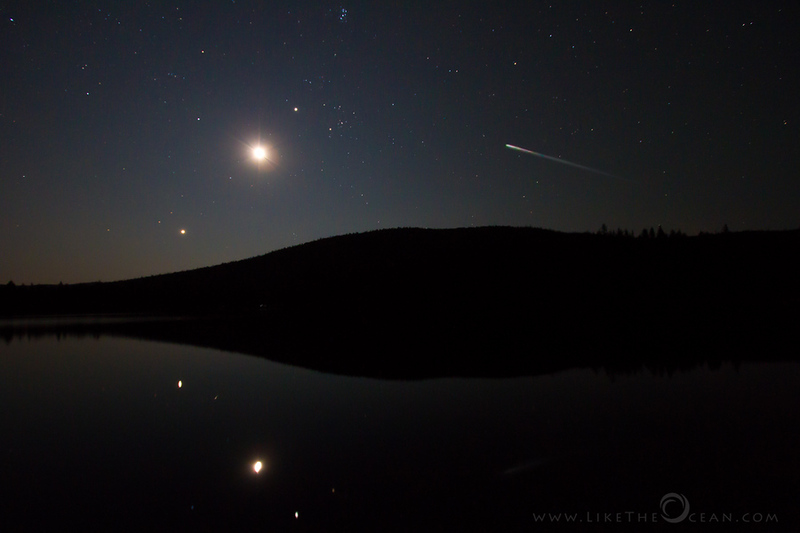 It can even be a composite of the foreground along with the lovely moon set as depicted above ! Many a time, the final shot is NOT going to be a result of just a random snapshot. It is something that starts with the vision, evolve as you go thru the different phases of planning and culminates in the final shot. Have the planning phase fluid enough and accommodate changes as needed. If you don’t know where you’re going, You’ll probably end up some place else! If you are planning to capture the Lunar eclipse along with the landscape, the location is very critical. The foreground element generally adds a lot to the shot. It not only defines the foreground composition, but also aids in perspective by the size of the moon (read more on this compression effect can be taken to advantage). The planning in this case becomes even more significant, as the path of the moon is not static even for a given landscape. Below are some of the tools that aid in zeroing down on that particular spot and identifying when and how the moon would rise for the identified landscape. Google Maps – Yeah the same application that you use to get directions, that has lot more data that can be used for Photo shoot pre planning. From Street view to the photos in a given location, it is very handy. The first use of the tool is for virtual scouting of any given location. It has amazing amounts of data that can literally help u get a feel for the area, without being anywhere close to it. Google Maps is almost always my go to tool for scouting. Play around with the Street view and Earth View as you look around the environment. Street View helps to visually see how the foreground is laid out, where that one tree is located, or if you have an open corn field toward your right. And while you are there check out the photos of the key spots on the bottom bar. This is not as great as Flickr, but does provide details on the surroundings. Flickr might not be as popular now, but it still hosts amazing number of images for any given location. I generally search in flickr with the location details [maps view] to get a feeler for what kind of shots / views are possible for the given spot. Don’t forget to check out the exif information. This can provide valuable inputs on the zoom, giving a hint on where the shot might have been composed from. If I am not able to get any hits, I fall back to Google Images. Google History – Nothing beats it being there in person. But not every place has a fixed address. There might be a tree – that u remember from a drive that you took 3 months, that might make a great foreground , but not sure of its exact location. Fear not, Google comes to the rescue again. If you have not explicitly disabled, all your location history is saved in your account (visible only to you). This is very handy to get back to a specific date & time and reverse look up in the Street view to get the location of that scene you want to get back to. Scouting from the previous night ! Check out this article for a step by step guide to using TPE to shoot the moon against a given landscape or even a cityscape. Stellarium – especially the desktop version is very handy for pre-planning. One can easily see the stars / galaxies that would be prominent for any given coordinates and time. 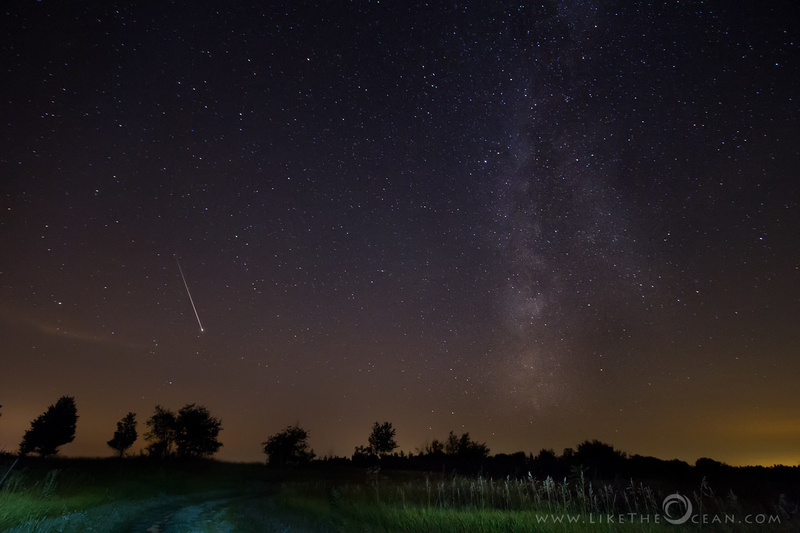 To locate Milkyway – look SE in the spring a couple hours before sunrise, look South in the summer around midnight, and look SW during the fall an hour after sunset. You can even download landscape for prominent locations or create custom skyline for your particular location. In addition you can also look for specific galaxies, planets, or even check if International Space Station (ISS) would be crossing the frame when you are shooting. In our case just search for moon and they play around with the date / time to see how the position of the same changes. Now that you zeroed down on the right spot, you want to ensure the clouds or rain don’t spoil the show !!! Lately, had found accuweather handy, to check extended forecast for more than a month ahead. Check out the trend / Forecast Maps for high level planning. Once you finalize the location you can drill down to location specific extended Forecast for up-to 45 days. Clear Dark Sky allows you to get details about the humidity, transparency, temperature etc. along with the cloud cover for the given location. if you are not geeky, just use the tool and ensure to have dark blue / black forecast under Cloud Cover for better visibility. You can use the website for planning on desktop or get it as an app to for use in the field. Dark Sky Finder is not as important as clear skies tool for shooting the Lunar Eclipse, but again, it all depends on what u want to shoot. If location is more important – like the foreground then this takes a back seat. But if u would like to shoot the eclipse against the stars (i really want to, presuming with the moon in the shadow, it would help to shoot along with stars and still not blow out the moon :)). Basically in this tool, you need to look for a location that is under Green or Dark blue, to be able to view and shoot the stars (milky way) in the night sky. TimeZone – This depends on your locations. While you are keen on planning the location, checking weather etc. just make sure you take a note of the time zone on which you would be shooting. This becomes crucial if you are located near multiple time zones or if you are final spot is located in the adjacent time zone. Just be sure to be aware of the local time especially for events like lunar eclipse. We had seen all the tools, options and technologies that would help us. In addition would like to share with you an actual planning that I did earlier this year. Thought the process of finalizing the spot, might help in your planning for subsequent events. As I was planning for the Lunar Eclipse (April 2015), the event was on the early mornings of April 4th. The moon would be setting towards west as it was getting into full eclipse over the horizon. Living near to Chicago, and wanting a open horizon view to the west, zeroed on the west coastal side of the Michigan lake. This has the highest potential of having a open horizon view in the early morning, when the eclipse was occurring. Based on the same started looking at couple of light houses from the area. Further planning was driven by weather. In addition to the clear skies, for the image to really make an impact, the size of the moon against the lighthouse plays an important role. This is achieved by something called as compression effect. For this ideally I would need to be more than 1500+ feet from the foreground element. This would aid to capture the lighthouse along with the lighthouse. I just love it, when a plan comes together :) The details are at a high level, but you would get a hold of it, once you start using each of these tools, apps & services. The links to the same with tutorials are in the next section. Feel free to ask any question in the comments !!! All the best for the upcoming planning ! The next big lunar eclipse is on Sept 27, 2015 !!! If you are pro, its a great guide for reference ! I am not a kind of person who learns by reading books. Don’t get me wrong, I do read a lot, but atleast in photography, it had been more of trial and error learning. I generally score the net for different articles, tips & videos depending on what I was trying to do / capture at that instant. So mostly, it is on the fly learning with respect to photography. Hence, when I got a request from Collier to review his book (btb it was so nice of you to reach out Grant !!! ), I was bit skeptical. But once I started reading, i realized how wrong i was :) It actually kept me occupied for couple of day with 150+ pages. Most of the information provided in available elsewhere, but this guide is great is refining & pulling it all together, along with personal tips, tricks and details. What I love about this book is how it is all laid out together – Starting from Equipment, Planning, Composition, Tools, Lighting and even details on Post processing. 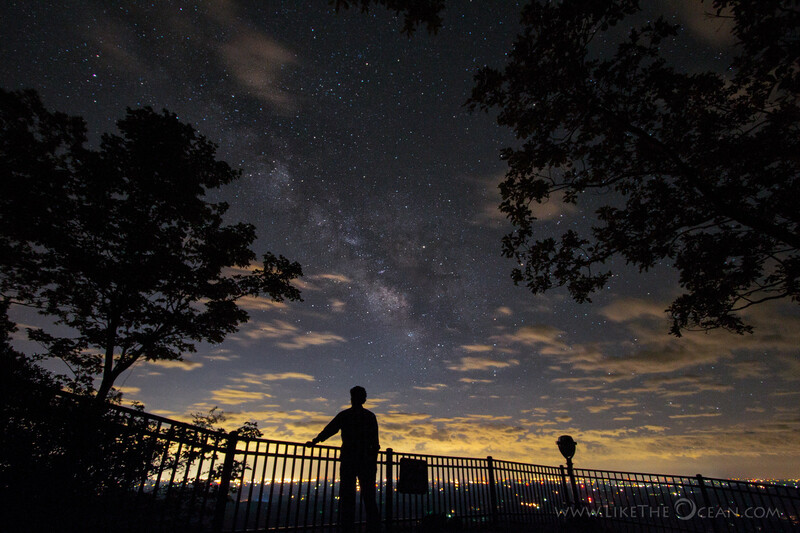 It is one comprehensive guide for night photography [not just stars :)]. Collier had shared a lot of tips from his experience which is quiet helpful. This book also contains some lovely photographs along with the settings to illustrate the items in discussion. Even though u could just print it out, it adds more value to read as an ebook, as it has active links to other articles, web pages of associates tools etc. This book is jammed pack with great information. 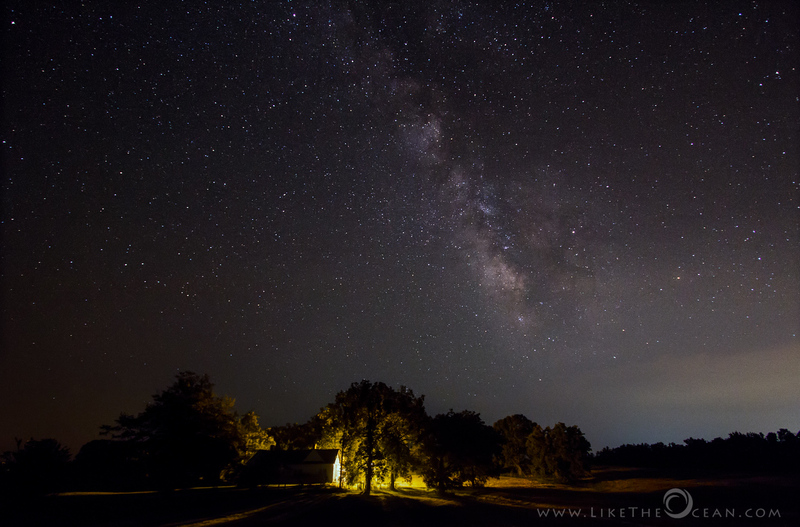 There’s a lot of good advice here that will help you plan & execute a successful night shoot. The more I read, the more it was evident that the advice comes from experience and the uncounted hours, he had spent, right in the field. This book definitely, saves all that time, you otherwise might spend crossing that learning curve.